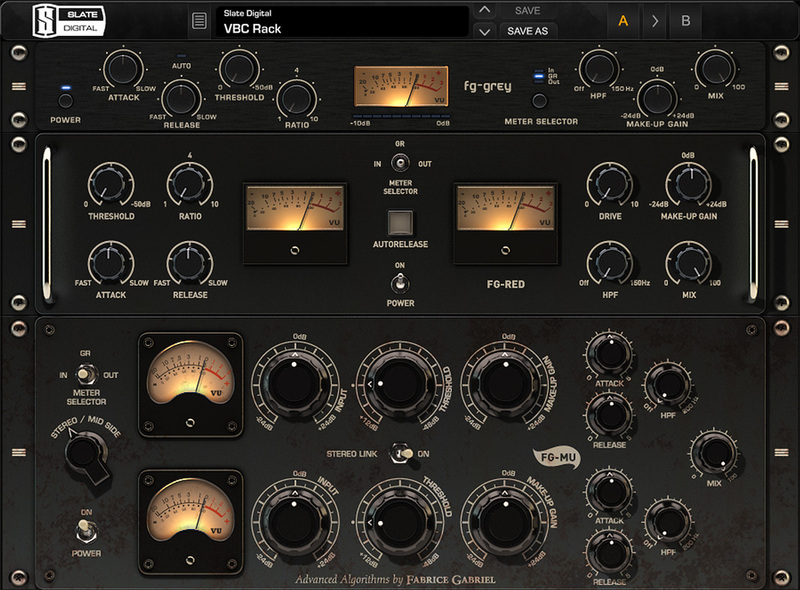 Virtual Buss Compressors comprises three unique sounding, 100% analog modeled dynamic processors that are ideal for program material. Every nuance of real analog compressors has been modeled; including the exact nonlinear characteristics of their transformers, tubes, VCAs, amplifiers, phase distortions, harmonic distortions, and timing. All of the compressors in the VBC bundle have a variable hi-pass filter AND a mix knob that can be used to control the ratio/percentage of the compressed signal to the dry signal. Each compressor can be used in series, and the series rearranged by dragging and dropping (see information on “The Rack”). Compressing a mix with each one doing a very little amount can sound amazing! And, using the compressors in series within the ‘Rack’ also makes it very easy to A/B/C the compressors on source material. Finally, VBC will come with stock presets made by some of the industry's top mixers. The FG-GREY starts off with a very precise model of the classic British "4000 series console compressor". I've used the hardware model for many years but until studying the unit in the modeling process, I never fully appreciated just how magnificent the piece is. It has a way of being able to tighten, glue, and 'gel' the components of the mix in ways that can go from fairly transparent in auto release mode, to very aggressive in manual mode. We did a small mod to the circuit in our virtual model which I think you'll really enjoy. We took the classic British discrete transformer and added some of the characteristics to the signal path. This does something very amazing to the clarity of the midrange and bottom end. The hardware unit tends to start sucking out too much bottom as you start to compress more. It can also get slightly 'choked' in the mids. These are subtle issues but the transformer stage keeps the bottom big and round and the midrange more open, while still retaining the classic sound of the hardware unit. You'll notice especially when you heavily compress with the FG-GREY, there is a bit less of a drop in the bottom and the rich mids will still be nice and present. I love the FG-GREY in both manual and auto mode, and it's amazing on drums and guitars too! This compressor is based on the classic RED faced compressor that has been a favorite of mix legend Chris Lord Alge, who first showed it to me when I visited his studio years ago. I thought it was odd actually. Here was this compressor that nobody else seemed to really use, and it was on a setting at 1.5:1 and the attack looked very fast for a Mix-Buss compressor. This was puzzling because I usually associated a faster attack with a loss of transient punch, but if you've heard Chris's mixes you know that they are the exact opposite of that! So being the classic gearslut, I bought one, (I got the unit with both input and output transformers). The first thing I did was put it on my mix in the settings that Chris showed me... 1.5:1, attack around 10/11 o'clock, auto release, compressing just 2-3db tops. And.... WOW! One of the clearest, punchiest sounding rock mixes I'd ever heard come out of my own speakers. This unit was amazing!!! When Fabrice and I analyzed the RED, we found out that it was indeed a very unique beast. The attack and autorelease work very uniquely and musically. But the real magic we found was in the output section! We found that just pushing the makeup gain a few db did some insane things to the sound! A little push and things got so much more punchy, fat, and aggressive. After more examination, we realized that this was due to a series of nonlinear reactions caused by the output transformer. Howie Weinberg, the famous mastering engineer who has a studio on our campus let us in on a little secret. He uses his RED not for compression, but just to use the output gain to get that amazing effect! So I decided to do something that the original unit cannot.. I put that output transformer effect on a knob called DRIVE. When you push this DRIVE knob, you get this beautiful punch and articulation of the transients, and you can control just how much you want, regardless of whether or not you use the makeup gain! Famous rock mixer Justin Neibank beta tested the FG-RED and loves the drive, suggesting '6.6' as the magic number. But you can try cranking it all the way for an interesting effect! I've been lucky enough to hear some of the most classic tube based buss compressors such as the Fairchild 670 and Manley Vari Mu. There is some real magic that happens when your mix goes through a brilliantly designed piece of tube gear. The midrange thickens, the lows get tighter and rounder, and the top end opens up with a beautiful sparkle... and even better, those harsh upper mid overtones seems to get tamed. For the FG-MU, we put all of these wonderful qualities into the algorithm. First and foremost, to hear the FG-MU, you don't even have to do any compression. Just going through the processor without any gain reduction will inhibit a beautiful open sound due to the modeling of the tube circuit path. Even when I'm using the FG-GREY or FG-RED, I love using the VBC Rack just so I can have the audio pass through the FG-MU! But on it's own, the FG-MU is an amazing sounding compressor. If you scan through the presets, you can get a great idea of what its capable of. Smooth rich compression, fat warm compression, and even slightly aggressive compression. But overall, this is a processor that has tons of analog mojo and vibe for days. A sure hit on your ITB mixes! While all three compressors are available as separate plug-ins in your DAW, you can also use them in our Virtual Buss Compressors Rack plug-in, in which they can be chained, reordered via drag and drop of the u-rack handles, and soloed independently. During the development of the VBC, I spoke to many top pros in the audio industry about mixbuss plug-in compressors. There seemed to be an overwhelming consensus that even though many of them were advertised as 'analog modeled', they still didn't have the classic sound of analog compressors. So Fabrice and I got to work. First we needed to examine the hardware compressors and the current crop of analog modeled plug-in compressors to see what was going on! And what we found was surprising. The classic analog compressors that we studied added some very complex nonlinear artifacts in their signal paths. Their sound was not simply based on their specific compression topology like timing and compression curves. Some of the analog compressors had modulations, dynamic harmonic distortions, dynamic phase distortion, saturation, crosstalk, and more. And just like in our Virtual Console Collection plug-in, these artifacts added a sonic imprint to the compression. Was this the magic sound that made the plug-in compressors sound different than the analog compressors? There was only one way to find out. We had to precisely model it. All of it! Several months later, we had algorithms that combined the exact compressor topologies, curves, timings, as well as the circuit's nonlinear dynamic artifacts. We were able to bypass JUST the artifacts, and the answer was very clear. Much of the magic tone that has been missing from many plug-in compressors is these nonlinear additives. When you hear the three VBC compressors, you'll notice a depth, life, and analog 'vibe' that you've likely not heard before in a plug-in compressor. I hope that you enjoy it on your mixes!